Prescription orthotics or orthotic foot inserts are terms used to describe a corrective shoe insole device that is fitted into your footwear or running shoes in order to correct overpronation, dropped arches and flat feet. Generally fitted by a Sports Podiatrist, the orthotics are designed specifically to fit your feet after a biomechanical assessment. Your prescription is then recorded and the prescription orthotics are manufactured to your requirements. There are “off the shelf” orthotics available from retail stores, however they are not designed to be used for an individuals prescriptive requirements. We only supply and fit prescription orthotics for general shoes and running shoes. We have 2 packages available in custom orthotics and can provide an accurate assessment of your individual needs. Laser Foot Scanning and Video Gait Analysis can support the biomechanical assessment in order to get the best results possible. Our Option 1 Orthotic Package is, in our opinion, the best prescription orthotic on the market today. Foot supports for children with dropped arches and flat feet may be necessary if the child is finding it difficult to walk or play sport. Often the child experiences knee pain or foot pain and this may be helped by correcting the lower limb biomechanics. Often temporary orthotics are made for the child until they finish growing. Once this happens they can be re-assessed and if needed, permanent foot insoles can be supplied. 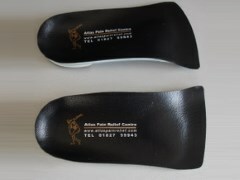 Childrens Orthotics can be supplied by Atlas Pain Relief Centre under the supervision of our Podiatrist Peter Taylor. Speak with a foot orthotics specialist today.